277 William Street in Melbourne. 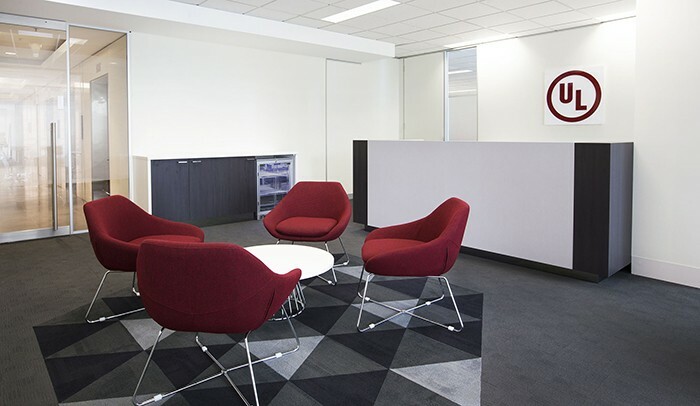 Through a simple palette of red, greys and white, the new office space is a modern and collaborative atmosphere that combines corporate professionalism and functionality. The front of house provides for an elegant, minimalist environment consistent with our client’s global logo as displayed within the reception area. Private offices and boardroom surround the waiting area with glazed partitions which allow for maximum light penetration while maintaining privacy. The client brief was to introduce secure areas where a number of rooms had slab to slab walls, high gauge steel mesh to the core of walls and triple sheeted plasterboard walls on both sides. Acoustic transfer ducts and mechanical services were considered due to the induction of the walls. ODC Design adopted an open plan approach for the back of house area offering flexibility among staff and enhancing teamwork. Workstations are spacious and made with robust, lightweight material which creates for an ergonomically and efficient workplace setting. Environmental sustainability initiatives were also incorporated with the introduction of green indoor plants improving indoor air quality. New amenities include a shower room and a break out area which is furnished with pendant light fittings suspended over a large island bench.